Price: 17.95 Euros available from specialist book and hobby shops, or direct online from AirDOC Publications. This publication is in soft cover and is a full colour glossy publication in standard A4 format. 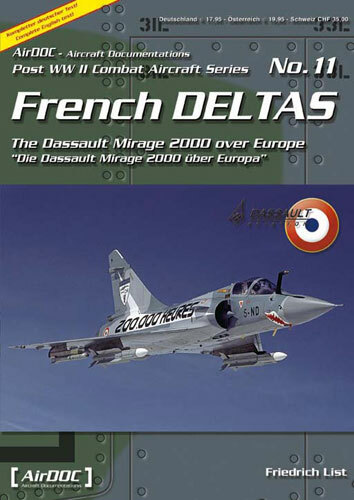 The publication covers on the Dassault Mirage 2000 in Europe and contains many photographs of the Mirage 200 in service with the French, United Arab Emirates, India, Taiwan, Indian, and Greek air forces. The publication contains 72 pages of German and the equivalent English text with approx 165 colour photographs and 21 colour plates depicting colour schemes flown by the various nationalities squadrons. The range of aircraft covers the Mirage 2000 prototype through to the Mirage 2000N. A brief history of each sub type is provided including development details and upgrades. The colour plates focus mainly on some very colourful anniversary or special schemes characterised for each of the nationalities. In summary, this is quite a comprehensive and nicely illustrated publication and will be a welcome addition to the collection of any person or modeller wanting good reference detail for the Mirage 2000 series.